After Gummo, Sevigny starred in the neo-noir thriller Palmetto (1998), playing a young Florida kidnapee alongside Woody Harrelson. Stephen Hunter of The Washington Post lambasted the film for having "bad writing," ultimately deeming it "somewhat dull and sluggish." She then had a leading role as a Hampshire College graduate in the sardonic period piece The Last Days of Disco (1998), alongside Kate Beckinsale. The film was written and directed by cult director Whit Stillman and details the rise and fall of the Manhattan club scene in the "very early 1980s". [b] Stillman said of Sevigny: "Chloë is a natural phenomenon. You're not directing, she's not performing—it's just real." Janet Maslin of The New York Times wrote that Sevigny "is seductively demure" in her performance as Alice. The film was generally well received, but was not a box-office success in the United States, only grossing $3 million—it has since become somewhat of a success as a cult film. Following her appearance in If Walls Could Talk 2, Sevigny was approached for a supporting role in the 2001 comedy Legally Blonde alongside Reese Witherspoon and offered $500,000; she declined and the role was given to Selma Blair. Instead, she starred in Olivier Assayas' French techno thriller Demonlover (2002) alongside Connie Nielsen, for which she was required to learn her lines in French. 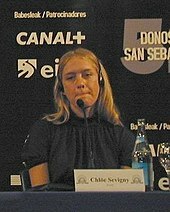 Sevigny described shooting the film as "strange," in the sense that director Assayas hardly spoke to her during the filming, which she said was difficult because of the lack of "input." After spending nearly three months in France to complete Demonlover, Sevigny returned to New York to film the Club Kids biopic, Party Monster (2003); coincidentally, Sevigny in fact knew several of the people depicted in the film (Michael Alig and James St. James included), whom she had met during her frequent trips to New York City's club scene as a teenager. In March 2013, Sevigny sold her apartment in Manhattan's East Village (which she had purchased in 2006) for $1.85 million, relocating to a classic six apartment residence overlooking Prospect Park in Park Slope, Brooklyn, which she purchased for $2 million. In 2014, she starred as Catherine Jensen in the crime drama Those Who Kill, which aired on the A&E Network. It was then re-launched on A&E's sister network, Lifetime Movie Network, on March 30, 2014, after being pulled from A&E after two episodes due to low ratings. The series was subsequently cancelled by the network after its 10 episode first season run. During the 29th International Festival of Fashion and Photography, which ran from April 25 to 28, 2014, Sevigny served as a judge of the fashion jury, along with Humberto Leon and Carol Lim. In the spring of 2017, it was reported that Sevigny had sold her Brooklyn apartment for $2.75 million. She subsequently starred as Lizzie Borden in Lizzie (2018), which premiered at the 2018 Sundance Film Festival, co-starring with Kristen Stewart. Sevigny had first expressed interest in developing and starring in a miniseries based on Borden in 2011. Michael O'Sullivan of The Washington Post wrote that Sevigny "is something of a closed book, delivering a stolid performance that can be read as either strong-willed or stonyhearted." Sevigny also appeared in a supporting role in The True Adventures of Wolfboy, which was filmed in Buffalo, New York in late-2017. ^ Monush & Willis 2006, p. 380. ^ Kennedy, Stoehrer & Calderin 2013, p. 285. ^ Apodaca, Rosa (March 18, 2007). 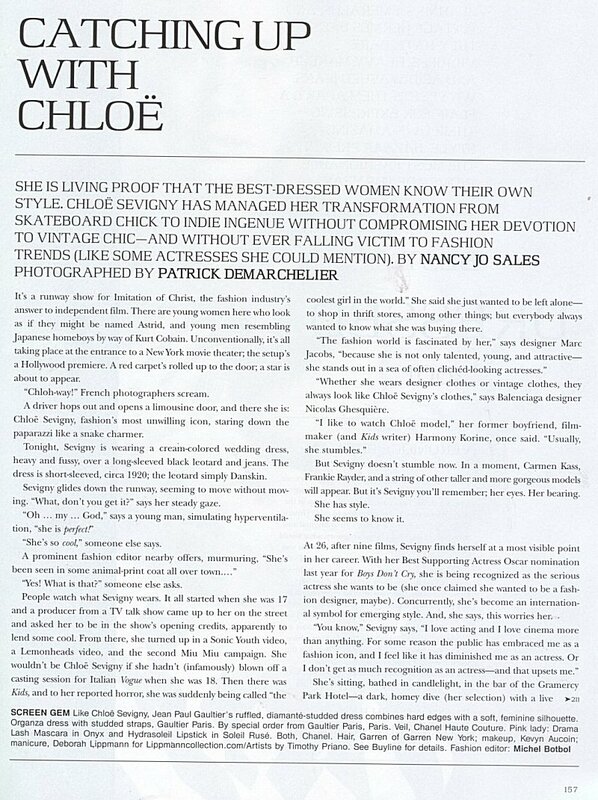 "Chloë Sevigny: Beyond the labels". Los Angeles Times. Tronc. Retrieved September 3, 2009. ^ Craddock 2000, p. xlix. ^ "Style stolen in Gummo". Chicago Sun-Times. Archived from the original on 2014-06-29 – via HighBeam. ^ Maslin, Janet (May 28, 1998). "Film Review: Last Days of Disco, Night Life of the the Young, Urban and Genteel". The New York Times. Retrieved January 1, 2010. ^ Turan, Kenneth (October 22, 1999). "'Boys Don't Cry': Devastating Price of Daring to Be Different". Los Angeles Times. Archived from the original on August 27, 2009. ^ Ebert, Roger (October 22, 1999). "Boys Don't Cry". Chicago Sun Times. Archived from the original on July 14, 2012. ^ Frey 2016, p. 175. ^ "Watch My Style: Rihanna wearing $440 Chloe Sevigny leopard print boots paired with denim daisy dukes". Yodon Bleak Raps. August 29, 2012. Archived from the original on October 28, 2012. Retrieved August 31, 2012. ^ Willett, Megan; Zeveloff, Julie (March 26, 2013). "HOUSE OF THE DAY: Chloë Sevigny Sells East Village Apartment For $1.85 Million". Business Insider. Retrieved August 29, 2018. ^ Egan & Thomas 2012, p. 85.